A security researcher claims changes Apple made to tighten its kernel security system in iOS 7 instead weakened the system, making it less secure than its iOS 6 counterpart. (Via CNET and ThreatPost) Azimuth Security researcher Tarjei Mandt discovered the flaw and presented his findings last week at CanSecWest. 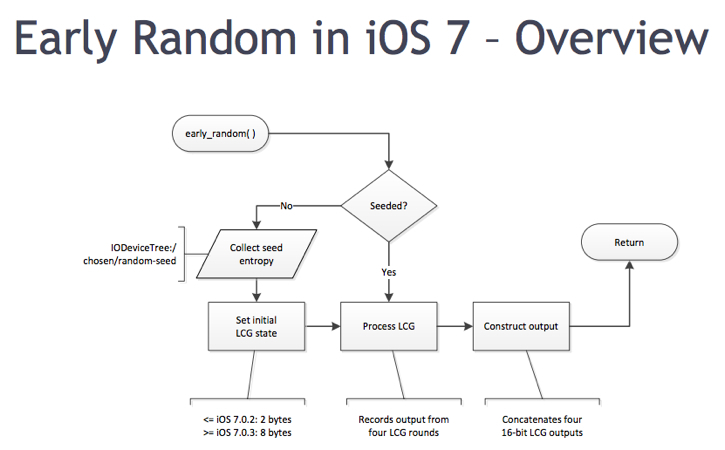 The security flaw involves the random number generator Apple uses to secure its kernel. In iOS 6, the number generator that encrypted the kernel derived its values in part from the CPU clock counter. Because it was based on time, the encryption was only marginally secure as the output values were predictable, especially when examining successive numbers. Apple was aware of the limitations in iOS 6 and attempted to tighten security in iOS 7 by changing the random number generator to a linear congruential generator, which is more susceptible to brute force attacks. This flaw potentially allows a malicious hacker to gain kernel-level access to an iOS device via an unpatched vulnerability. The kernel is the base part of the iOS operating system and controls low-level functions such as security and resource allocation. Apple approached Mandt about his findings and asked for his CanSecWest slide presentation. Couldn't have been an accident that someone missed, could it? Nah....everyone get your tin foil hats out cause everyone's out to get us. Modern Intel chips (made after 2008 I think) have ISK which produces actual random values rather than pseudo ones. I guess ARM lacks that right now. No. Apple would never do this. They never compromise on customer security for anyone. Random Number Generators are a tricky business. The company I work for has a whole slew of patents and protected IP just for the RNG we use. I like how negative things like this never makes it to the Front Page and not many throwing a punch at Apple like they do for other companies. I am sure if it was any other company, this news would have been the first frontage news. I feel this is done deliberately by MacRumors for generating $$. Just pathetic. I came across this story on the front page of MacRumors, as I'm sure many others did. iOS 7.2 here we come. Perhaps It will facilitate a 7.1 Jailbreak. It's not in the slides but I'd be curious to know how much brute force is required? It reads like a restart would require calculation to start again? Could an app be crafted inside the sandbox to not only gather enough info but to also then have enough time to process that info to get the information it needs to launch an attack without highlighting is presents. Yes "security by obscurity" = bad. Yes, could be better. Still if attack needs more than minutes of full throttle processing it goes to take some fairly careful crafting to hid it. Putting more in "Alert but not Alarmed" territory. It's very hard to say how much of a problem there actually is. My understanding - which may be wrong - is that this random number generator is used at the very early stages while iOS is booting, and is then replaced with something a lot stronger. There's the claim that the random number sequence could be predicted, but then I wonder which non-Apple software would be running on the device at the early stages when this random number generator is in use. Quite possibly none at all. They have such great sources of entropy: signal strength, gyros, accelerometers, temperatures. I thought they employed some of these? At least arc4random()? The article states this entropy pool is not available at boot time, when the number is generated.